Art Center with Fine Art Gallery, Classes, Workshops, and More! *If you would like to receive our email newsletter, please email artistsgallery@bellsouth.net and let us know! Nancy was born on St. Patrick's Day in Asheville, North Carolina and currently lives in Charlotte. Her father was from South Carolina and her mother from North Carolina. As you can see, Nancy's heart and her roots are in the Carolinas! 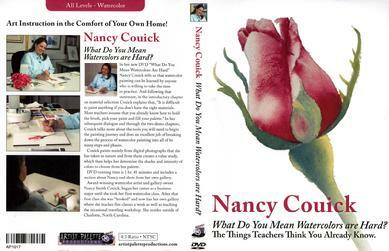 Nancy and her family lived in Birmingham, Alabama and in San Jose, California returning to Charlotte in 1981! Nancy paints in watercolors and acrylics and has studied with numerous well-known artists including Harris Holt, Joseph Bohler, Susanna Spann, Margaret Hall Hoybach, Steve Rogers, Robert Burridge, Karlyn Holman, Anne Abgott, Joe Miller, Karlyn Holman, Suzanna Winton, Joseph Fettingis, Anne Vaselik: many who now teach workshops at Nancy Couick Studios! Leading an annual painting tour in Italy, Nancy is currently working on a series of works based on Italian life and the Italian countryside. Some recently completed paintings are of Portofino, the Cinque Terra, Lake Como, Venice, Cortona, Tuscany - including Pienza, Lucca, Florence, Bagno Vignoni, Siena, San Gimignano, Montepulciano, the Tuscan countryside and of Rome. Subjects included villas, lakes, a barber in his shop doorway, a dog guarding his master's shop, a canal in Venice, streetside venues, harbors and boats. The past few years tours have led Nancy's group to Tuscany, Venice, the Amalfi Coast, Rome, Umbria The Italian Riviera, Piedmont, Chianti, Lake Maggiore and other beautiful areas of Italy and to Portugal also. The tours have something for everyone as cooking classes will be a part of the adventure in a four star Villa Hotel on the Amalfi Coast just above Sorrento, (followed by a trip to Rome) A great trip for painters and non-painters alike! Nancy continues her Botanical Garden series. Some of these works can be found in the museum shop of Brookgreen Gardens in Pawley's Island, S.C. She is well known for her beautiful flower portraits painting close-ups of magnificent blossoms. Some of her favorites are roses, peonies, calla lilies, tulips, azaleas, magnolias, and irises. Nancy's works can be found in corporate and private collections in the United States, Italy, South Africa, and in Australia. Professional memberships include: Watercolor Society of North Carolina, Guild of Charlotte Artists of the Mint Museum, Charlotte Artist Society. Nancy teaches weekly classes and workshops in watercolor painting in her studios in Charlotte, and other locations throughout the Southeast and in Italy. 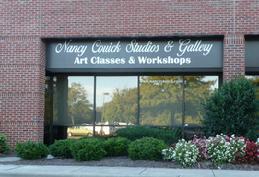 Nancy is the owner of Nancy Couick Studios and Gallery in Charlotte, NC. "What do you mean Watercolors Are Hard? Things teachers think you already know!" Featuring many tips on How to paint in Watercolors, Materials, brushes, paper and paints. A "How-To" lesson to get you started. Nancy show you how in a step by step approach. Call us at 704-541-6944 today! Easy to reach from I-485 to either the Johnston Road exit heading North, or from I-77, take I-485 East, then take Exit 64A to Pineville-Matthews Rd. heading North, after one stoplight, continue past a Macdonalds and a Bojangles restaurant on your left, and turn left just before the church steeple onto Park Cedar Drive. go .3 mile and turn left into the parking lot at 10100 Park Cedar Drive, continue straight ahead and turn right when you reach the building ahead, you will see Nancy Couick Studios and Gallery on your right near the end of the building. Plan B: If you don't like turning across traffic onto Park Cedar Drive, you can take exit 64A, turn left at the stoplight o to Park Rd, go to the second stoplight and turn right (CVS on the corner)to 10100 Park Cedar Drive . From Charlotte heading South on Park Road, turn right onto Park Road where it meets Johnston Road, go to the stoplight (CVS on your left) turn left onto Park Cedar Drive, follow to top of "small" hill and turn right into large parking lot go straight to end of buildings and watch for the sign above, we're in Suite 188. All images (including photographs) on this site are copyrighted and may not be reproduced in any form without express written permission from the artist.